If you were wondering what OnePlus' 5G phone or the OnePlus 7 are going to look like, we may now have the answer. 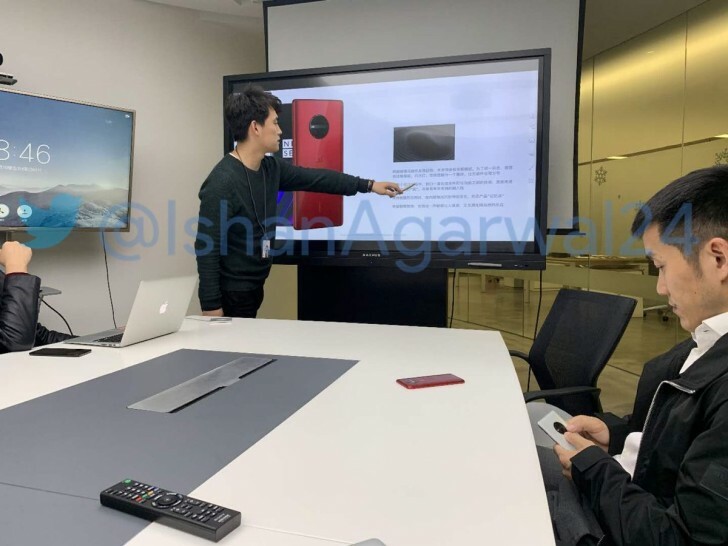 The image you can see below has been leaked today, and it's a shot from an internal company meeting, with OnePlus CEO Pete Lau attending. The employee who took the picture surely risks being fired for this. Anyway, as you can see, the design of the back is a pretty big departure from OnePlus' recent phones, with a huge circular camera island. The device on the slide is red, as is a prototype just laying on the desk, but there's also a white model in development - don't miss the right part of the shot. It's unclear which handset this is, but given the fact that the 5G phone is coming sooner than the OnePlus 7 we'd venture a guess and say it's more likely to be that model. This will launch in early 2019 and don't be surprised to see it offered by T-Mobile at some point - in light of the carrier's recent partnership with OnePlus for selling the 6T. An additional factor lending credence to that hypothesis is that OnePlus still hasn't figured out how to do mmWave 5G in a phone (because of how many antennas are needed), so it's going to start off by going with the so-called "sub-6GHz band" 5G, which will be used in the US by, you guessed it, the magenta carrier. And also Sprint, but the two are in the process of merging. In the meantime, the first carrier to get the OnePlus 5G will be EE in the UK (and yes, it's also using sub-6GHz). The phone is expected to be $100 to $200 more expensive than the 6T because of all the additional bits and pieces required for 5G. It will be powered by the Snapdragon 855 chipset paired with the X50 modem. The 855 should also feature in the OnePlus 7, but with the 4G X24 modem instead. True, their camera quality is not the best, but then again its still better than Nokias made by Foxconn (or HMD Global oy oy). Just saying, back camera from this photo remaind me of 1020 camera design, nothing more, or less..
Hahaha! The word quality is something that should definitely not be in the same sentence with OP. That's how good their quality is. (I'm being ironic). Also the back is definitely another copy/paste job. This time stolen from Nokia.